If your business needs financing quickly or has bad credit, a merchant cash advance could be your best choice. A merchant cash advance s a way of getting business financing by selling a percentage of your future profits for a cash advance. Technically, they aren’t really loans, though it works in a similar way, since you’re handed money and agreeing to pay it back. The differences are two. First, you’re technically selling a percentage of future sales. Second, you make payments based on sales, rather than making regular payments, so there’s flexibility depending on how well your business is doing. This financing structure can be helpful for seasonal businesses that might go through slow periods. It’s also good for business owners who don’t have great credit, since approvals are based on your business sales, rather than your business credit. On the other hand, the flexibility of merchant cash advances means repayment rates tend to be a lot higher. While a regular loan will have fixed monthly payments that cover the interest and a portion of the principal, a merchant cash advance takes a percentage of your business’s daily or weekly credit card sales. Since the amount you’ll be paying off on the advance will fluctuate, the repayment rate tends to be a lot higher than with most regular loans. In fact, merchant cash advances have some of the highest costs in business financing. The two important numbers to keep in mind when it comes to repayment are the holdback rate and the repayment rate. The holdback rate is the percentage of your profits that go toward paying off your advance. This is usually somewhere between 10% - 20%, depending on how risky your lender perceives the investment to be. The repayment rate is the total amount you’ll have to pay back, meaning the amount of the advance plus the extra your lender charges to make a profit. This is usually expressed as a factor. For example, if you borrow $40,000 at a factor of 1.3, you’ll owe $53,000 in total. Average repayment rate factors are between 1.15 and 1.5. Knowing your holdback rate, your repayment rate, and your average daily credit receipts should be let you calculate roughly how long it will take you to repay your advance. Credit requirements are usually more lenient for merchant cash advances than for traditional loans. Most institutions prefer to lend only to businesses with a FICO rating of above 600. Others have no credit requirements at all. The more lenient the requirements, the higher the repayment rate. Most institutions will also want to see that you have a steady history of monthly credit card transactions, usually at least $2500 to $5000. Bad credit can make it pretty hard to get financing for your business. Luckily, getting a merchant cash advance only requires a good amount of business revenue and credit card transactions. Even with their higher repayment rates, an MCA can be a good option for if your business is profitable but your credit isn’t great. Not only do they have an easier approval process, but simply using one and paying it off can help to build your credit and open you up to other borrowing options in the future. A no-credit-check financing option can have a number of benefits. Your business may not have been around long enough to have the credit history needed for a traditional loan, or maybe you’ve had trouble paying off a loan in the past and it’s damaged your credit. It might also be that you don’t have the time to wait for the processing needed for traditional loans, like in case of a business emergency or a sudden investment opportunity (MCA’s can take just 3 days to process). However, borrowing without a credit check usually means higher repayment rates, and is best used as a last resort when you're having trouble getting access to other options. Another thing to keep in mind that having trouble paying off your MCA on time could damage your credit even further, and it’s important to be sure you can afford it before you commit. For the most part, there aren’t any government regulations for merchant cash advances. This is because they’re not technically loans since you’re actually selling something, your future profits, rather than borrowing. This frees MCA companies from any laws regulating loans. While there is a call for regulation of merchant cash advances, it seems unlikely that the change will come anytime soon. For the meantime, you’ll have to be careful in choosing an MCA broker, since they can sometimes be predatory. Most traditional lenders require at least two years of business and personal credit history. If your business is new, this can make it hard to get the financing you need to grow your business. 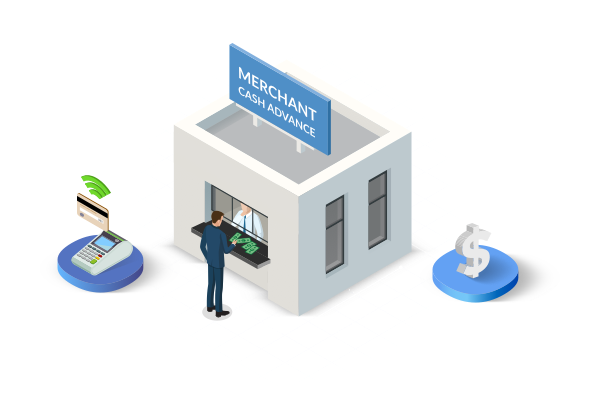 A merchant cash advance can be costlier than traditional loans, but in the right circumstances, it might be the perfect tool for growing a young business or solving a financial dilemma.